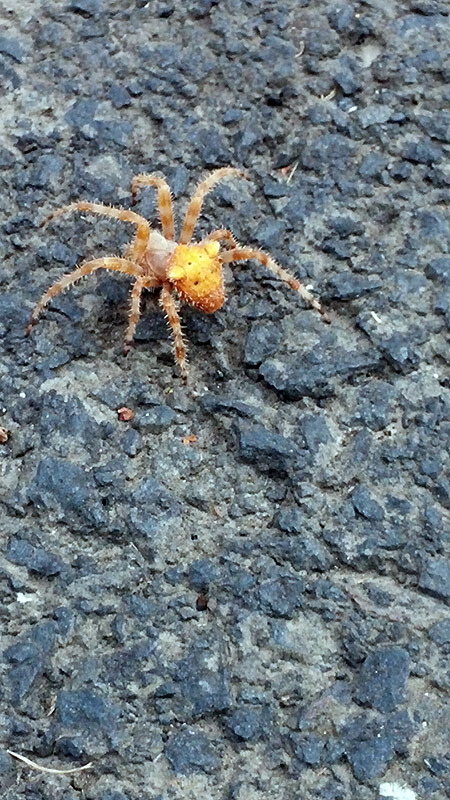 As far as I can tell by comparing it to photos on the Internet, that's a specimen—about an inch and a quarter across maybe, counting the legs (with the bright orange color, my first impression was of a tiny crab! )—of Araneus gemmoides, aka the Cat-faced Spider; perhaps you can see why it has that name from my photo, even though it's actually the back end of the spider that we're seeing there. ^..^ And it seems they are highly regarded by gardeners for their pest-eliminating prowess!